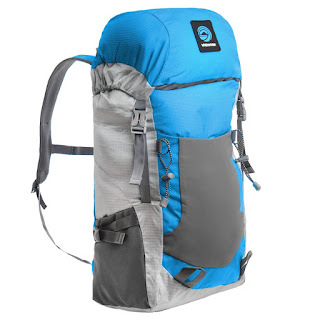 Check out this *HIGHLY RATED* WildHorn Outfitters Highpoint Packable Backpack $17.99 (Retail $49.99). LIGHTWEIGHT MATERIALS - At 13 ounces, this ultralight daypack is easy to carry and store. Highpoint backpacks utilize extremely durable nylon construction. Our frameless design allows this pack to provide the most essential combo of space and weight for day hiking or day trips. Ideal for men and women. TRAVEL PACK - Wildhorn's unisex Highpoint packs compress into just 9x6x1.5" when folded into integrated travel pouch, that also doubles as a handy security pocket for valuables when pack is in use. These multipurpose daypacks are small and ultra light, making it easy to take on any backpacking or camping journey. EXTERNAL WATER BOTTLE SLEEVES - Highpoint bags come with two outside water bottle sleeves to help you stay hydrated on your hike or other outdoor adventure. You can access your drink easily while keeping the inside of your bag dry, which we all know is a big deal. LARGE CAPACITY - Don't let the mini traveling pouch fool you, with over 30L of space, there's room for all your essential climbing and hiking accessories. You really can load it up with whatever you need for the day to get to the summit and back! EXTERIOR COMPARTMENTS - From four-way stretch pockets to various loop and tie attachment points, the Highpoint is a space saver. A casual separator for your trekking poles/ ice ax creates easy, quick access and adds to this classic daypack. Unlike many compressible daypacks, the Highpoint also comes with a zippered hood compartment at the top of the pack.